Mission Statement: Providing access to knowledge and information to inform, educate, entertain, and serve. LIBRARY DISCRIPTION: The Roanoke Public Library is located in the town of Roanoke, Indiana in Huntington County. The library district is the residents living within the city limits of the town of Roanoke, Indiana. 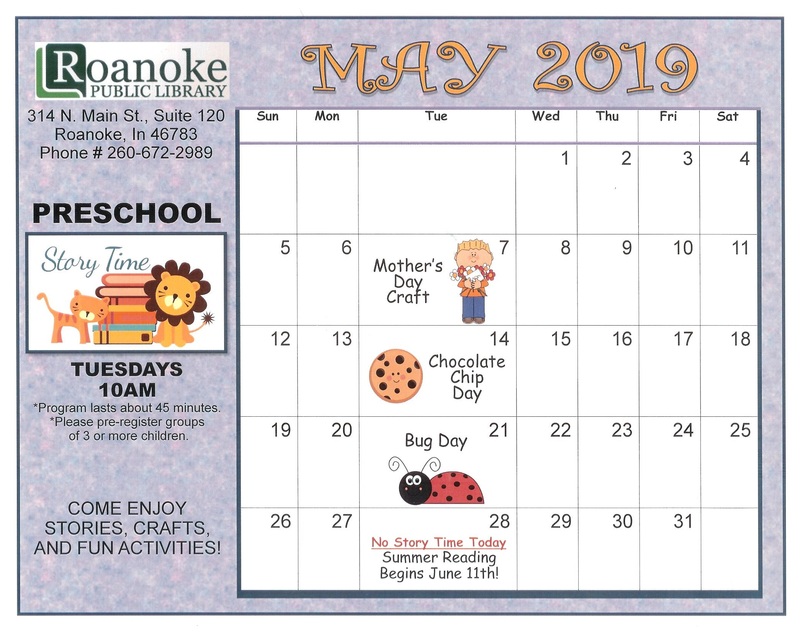 The physical address of the Roanoke Public Library is 314 N. Main Street, Suite 120, Roanoke, IN 46783 with a mailing address that includes PO Box 249. LIBRARY BOARD: The Roanoke Public Library is governed by a Library Board of Trustees. The Library Board is composed of seven (7) members. The Board members are appointed as follows: three (3) by the Huntington County School Board; one (1) by the Huntington County Commissioners; one (1) by the Huntington County Council; one (1) by the Roanoke Town Council and one (1) by the Roanoke Town Council President. LIBRARY STAFF: The Roanoke Public Library employs one full-time employee and two part-time employees. MATERIALS AVAILABLE: access to over 3.5 million bibliographic records which in turn provides access to over 5.5 million items thanks to being part of the Evergreen Indiana Consortium. General Information-The Library offers General Information that helps meet the need for information and answers questions on a board array of topics related to work, school, and personal life. Basic Literacy-The Library offers Basic Literacy service that addresses the need to read and to perform other essential daily tasks. Formal Learning Support-The Library offers Formal Learning Support that helps students who are enrolled in a formal program of education or who are pursuing their education through a program of home schooling to attain their educational goals. Lifelong Learning-The Library provides Lifelong Learning service that help address the desire for self-directed personal growth and development opportunities. Business and Career Information- The library offers Business and Career Information services that addresses a need for information related to business, careers, work, entrepreneurship, personal finances, and obtaining employment. Goal 1: People in the Town of Roanoke’s area will know that the Roanoke Public Library is available for general information; literacy; formal learning; lifelong learning and business /career needs. Objective 1: Each year, increase community awareness so that number of patrons increases 5%. Number of Patrons (previous year) (EX: 2016 data) Number of Patrons (current year)(EX: 2018data) Increase /Decrease Percentage of Increase/Decrease Goal of 5% increase met? Objective 2: Each year, increase funds to improve library offerings by 1%. This Objective will be evaluated by the Board of Directors annually at their January meeting. Number of events Library participated in and amount earned through each event (previous year)( EX: 2013 data) Number of events Library participated in and amount earned through each event (current ear)( EX: 2014 data) Increase Percentage of Increase Goal of 1% increase met? 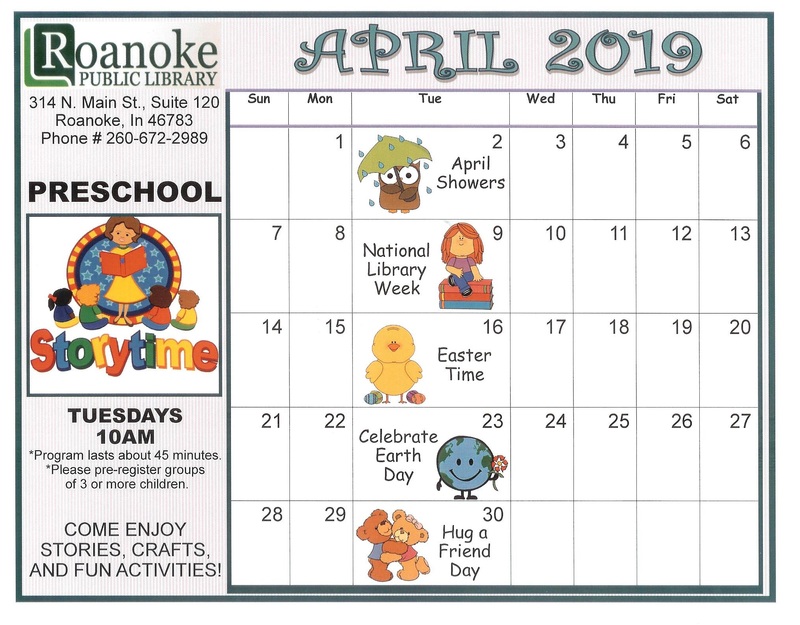 Goal 2: Children in the Town of Roanoke will have ready access to a wide variety of programs and materials to meet their general information, basic literacy and formal learning needs. Children’s books circulated as per Circulation report (previous year) Children’s books circulated as per Circulation report (current year) Increase Percentage of Increase Goal of 3% increase met? Objective 2: Each year, the number of children actively participating in the Summer Reading Program will increase by 1%. This Objective will be evaluated by the Board of Directors annually at the meeting after the conclusion of the Summer Reading Program. Number of Children enrolled in the Summer Reading Program (previous year) Number of Children enrolled in the Summer Reading Program (current year) Increase Percentage of Increase Goal of 1% increase met? Objective 3: Each year, the number of children attending Story Time during the school year will increase by 2%. Plan a weekly Story Time, including books to read, show a short video on movie screen and a craft or game. Number of people attending weekly Story Times (previous year) Number of people attending weekly Story Times (current year) Increase Percentage of Increase Goal of 2% increase met? Goal 3: Young Adults and Adults in the Town of Roanoke will have ready access to a wide variety of programs and materials to meet their general information, basic literacy and lifelong learning needs. This Objective will be evaluated by the Board of Directors at the meeting following the conclusion of the class sessions. Number of people attending and surveyed Number of people surveyed responding positively Percentage of positive responses Goal of 70% positive met? Objective 2: 45% of young adults in attendance will indicate that they will visit the library more often for their educational and recreational needs because of attending the library’s program(s). This Objective will be evaluated by the Board of Directors at the meeting following the conclusion of the program(s). Number of people attending and surveyed Number of people surveyed responding positively Percentage of positive responses Goal of 45% positive met? Objective 3: Each year there will be an increase 5% in the number of people using the library’s six (6) patron computers, wireless hub and other computing equipment,which will be used as needed. Number of people using the library’s computers and wireless (previous year) Number of people using the library’s computers and wireless (current year) Increase/Decrease Percentage of Increase/Decrease Goal of 5% increase met? Goal 4: The town of Roanoke residents will have ready access to information to enrich their businesses and careers. Objective1: Each year, 3% will indicate they increased their chance of employment or better employment because of the Roanoke Public Library. This Objective will be evaluated by the Board of Directors at the meeting following the conclusion of annual February patron/community survey. Number of people surveyed Number of people surveyed responding positively Percentage of positive responses Goal of 3% positive met? Objective 2: 50% of local business will indicate the Roanoke Public Library is an asset to the community. Number of people surveyed Number of people surveyed responding positively Percentage of positive responses Goal of 50% positive met? REVIEW: The Board of Trustees will review this plan; evaluate objective successes/failures; update goals; update budgeted amounts and other needed corrections/ amendments annually at the January meeting. On January 28, 2010, we attached to the Evergreen System offered by the State of Indiana. In November 2011, we attached to the Central Indiana Digital Consortium which allowed the library to offer eBooks and digital audio books to our patrons. In the March 2013 the library upgraded from a T-1 line to Fiber Optics with its move into new facility. In 2016, the library joined the SRCS system to increase its sharing of materials capacity through an even wider range of library facilities. The goal is to provide the major source of information for our patrons, enhance communication and encourage learning for all age groups. Goal: The Library will maintain and improve the usage of Evergreen Indiana System. Goal: The library will strive to protect its computer equipment from physical damage and hackers. Objective: The library board will create and implement a secure password policy. Goal: Address the technology training needs of the library staff including workshops and online courses. Objective: The library will promote training in the staff performance evaluation process. Objective: The library will develop a procedure for evaluating the success of training. Objective: The library will see that all staff members receive continued training in the Evergreen Indiana system. Goal: Provide electronic resources to the public. Objective: The library will continue to utilize inter-library loan service through the state of Indiana and the Evergreen Indiana system. Objective: The library will use the Evergreen Indiana system for cataloging records of all present and additional acquisitions. Objective: The library will continue to maintain at least 6 patron computers connected to the Internet. Objective: The library will verify sufficient network hardware capacity to accommodate additional computers. Activity: Work with a data cabling contractor to evaluate the possibilities and requirements for adding network capacity. Activity: Review requirement of additional hubs or switches to accommodate more computers. Objective: The library staff will continue to assist patrons who wish to use the wireless capabilities. Objective: The library will actively seek grants/donations to purchase new computers and technology items. Objective: The library will scan historical documents and pictures into the system. Objective: The library will continue to maintain its own website using Open Source through the State Library. The library director will maintain this with help as needed from experts in the field. Activity: The library will use the service provided by the State Library to host its website as this is Open Source software. Objective: The library will make our library web site design and content accessible for disabled users. Activity: Review web for description of the most important barriers to web site accessibility and practical solutions for addressing these barriers. Activity: Perform an accessibility evaluation of your library web site. Objective: The library will perform a usability evaluation on our library web site. Activity: Design a usability evaluation for our library web site by recruiting five library patrons. Activity: Provide a script and set of questions for each user to evaluate the website. Activity: Prepare a summary report of problems found and what needs to be changed on the library web site in order to correct them. Objective: The library will evaluate subscriptions to additional online reference databases. Objective: The library will update Community Information records by December 30 of each year. Goal: Explore ways to increase Internet stability and speed. Objective: Board will update computers and peripherals on an as-needed basis. Objective: Investigate offering new internet based technology services. The Roanoke Public Library has a staff of only 2 people with another who comes in on a temporary as-needed basis. They will attend workshops, seminars and other training sessions as they become available and necessary in order to perform all the needed activities to stay up to date with current and expanding technology. This will be done through programs offered through Webjunction, the Indiana State Library, ILF, MCLS and any other sources that may become available nearby or online. See Tuition Reimbursement Policy for more information. Outside IT personnel will come on site monthly and do all maintenance work. Library Director will report on work done by IT personnel to the Board at each meeting. The library staff will monitor computer and other equipment usage, through check-in records and observations. The board of trustees will be responsible for developing qualitative and quantitative evaluations of the services used by public and/or staff. This policy was adopted 1/22/18. Reviewed 11/27/18. It's Saturday 3:19 AM — Sorry, we're closed . Hope you can come when we're open.